Blurb Description: Sam and Hannah only have the holidays to find 'The One'. Their lobster. But instead of being epic, their summer is looking awkward. They must navigate social misunderstandings, the plotting of well-meaning friends, and their own fears of being virgins for ever to find happiness. But fate is at work to bring them together. And in the end, it all boils down to love. For Hannah, this summer, the summer between everything she knew and everything that is going to be is all about one thing: Finding her Lobster. Finding The One. For, you see, lobsters mate for life, and that’s exactly what Hannah wants, what many of us want! Okay, well, not just one, but someone special. Someone she can call hers. It all seems rather silly to tell his mates- Chris, Robin and Ben- but the connection lingers on. in his mind, and unwittingly, in his heart. For Sannah (yes, Sam and Hannah!) are going to learn that nothing is easy in the world we live in, especially not love. Especially when this love is based on a five minute conversation in a bathroom. Especially when we have our self- created social misunderstandings to navigate through. However, all we have to do is believe, that it will all boil down to love! 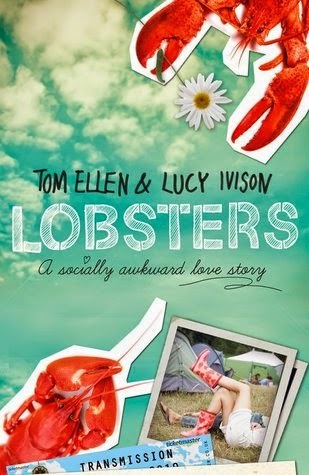 Lobsters in a fun, light read that highlights what each and every teenager goes through today- social awkwardness, peer pressure, understanding yourself and the need to find someone that wants to as well! From London, to Greece to a crazy music festival, here is a love story that may not be perfect, but is most definitely real! I couldn’t say I had any major problems while reading it, but, there were a few times- just once or twice- where I felt that the tale was just dragging along, especially in the end. Moreover, the book is told entirely in British/ European slang, and being from India, I felt a little confused and weirded out at times. These are all, however, minor problems and didn’t keep me from enjoying it! I would recommend Lobsters mostly to older teens, due to the content, or anyone who wants a light read that will leave you smiling and thinking about life and what we go through to find our Lobster! I love reads such as this one. Thanks for sharing!